May the lily be with you. Those of you who think there are no currents on the Burgundy canal are right. However Burgundy has more than its fair share of currants and that’s what we’re celebrating this week as we just received our first seasonal delivery of Crème de Cassis. For those who don’t know, Crème de Cassis is a liqueur made from blackcurrants. It’s inky purple, viscous and slightly sticky, and it’s a particular speciality of our local region around Dijon. It’s also a part of the staple diet. Unless you want a major con-currant (there’s that currant word again!) 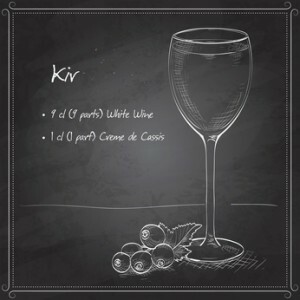 sugar and alcohol hit you wouldn’t want to drink it neat, but it’s an essential ingredient in that most classic of Burgundian aperitifs ‘Kir’ – invented by and named after the eponymous Monsieur Kir who just happened to be Mayor of Dijon at the time. Back in the day many of the smaller family run restaurants often used to bring you a Kir as a matter of course along with the menu. Certainly it’s a favourite pre-prandial drink on Le Papillon, along with its more sophisticated elder sister ‘Kir Royale’. Hereabouts Kir Royale is traditionally made with a ‘Cremant de Bourgogne’ – the local sparkling wine. Much of it comes from St Bris, one of the oldest wine villages in North Burgundy. Elsewhere you may find it with any sparkling wine, up to champagne. The local work-a-day Kir in these parts will always be made with a white wine called Bourgogne Aligoté. As a grape variety it’s not as round or as full as the great chardonnays and generally considered as an apéritif wine. That said, if you get a good one, and we pride ourselves on always having a good one on board, there’s no reason not to drink it straight up. It’s especially nice with a summer lunchtime barbecue. One of the real beauties of Kir is that they still sell it in wonderfully branded stoneware bottles with fabulous old-style graphics that are very much ‘fin de siecle’ (turn of the 19th century) that would do Toulouse Lautrec justice. The only problem is that we hate to give away these little works of art when they’re finished! It’s too early for the currants just yet although the ones nearby look like they’re about to flower. The philosophy in France though is that ‘everything good takes time’. Whether it’s a local liqueur, wine, cheese or a sausage, patience here is a virtue. That’s why there’s no such thing as a quick cruise on Le Papillon, it’s an altogether more sedate and slow journey. You know, we’re not sure there are many places left in the modern world where that rings true. As we’re talking about cassis we thought it only right that this week’s recipe, taken from Eleanor Garvin’s excellent cookbook The Papillon Recipes (available from Amazon) should be about blackcurrants too. She found the dish in one of the little restaurants around the famous Les Halles market in Dijon. Preheat the oven to 200˚F. Cover a cookie sheet with parchment paper. Beat the whites (preferably in a large copper bowl) until they are firm, then add ¾ of the sugar and beat for a minute more until shiny. Sprinkle over the remaining sugar, corn-starch and vinegar. Continue beating for another two minutes. Using a large spoon put 10 mounds of meringue on the parchment paper. With the back of the spoon make a shallow indentation in each mound, deep enough to hold a scoop of sorbet. Bake for 1-1 ½ hours until the meringues are dry but not coloured – the trick is to cook them slowly so that, when done, they lift easily off the parchment. Let them cool in the turned-off oven with the door closed for a couple of hours. Make the syrup by putting the sugar and water in a saucepan to bring to the boil. Reduce by 1/3 and let the syrup cool before chilling. 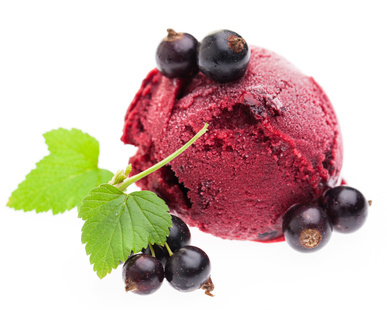 Puree the blackcurrants in a blender with the juice of ½ lemon. Strain the puree through a fine sieve pressing the berries until you have a cup and a third of juice. Mix the juice with the chilled syrup and put this mixture into an ice cream machine. When the mixture is almost frozen add the small amount of egg-white and continue processing for a couple of minutes – you will notice the sorbet becomes fluffier. In a small saucepan heat the remaining cup of berries with the ½ cup of sugar. Bring to the boil and simmer just until the berries start to pop. Add the crème de cassis, let cool and reserve. Serve in shallow bowls topping each meringue case with a coop of sorbet and spooning some of the sauce over and around each one.